I’m all for a good Holiday Cookie Exchange, but what do you do when all your exciting new recipes for the season aren’t cookies? I fell in love with the pictures for these Dark Chocolate Candy Cane Brownies from My Baking Addiction as soon as I saw them. Although I have the toughest time making brownies stay together when I dish them out, the flavor of these were still amazing. 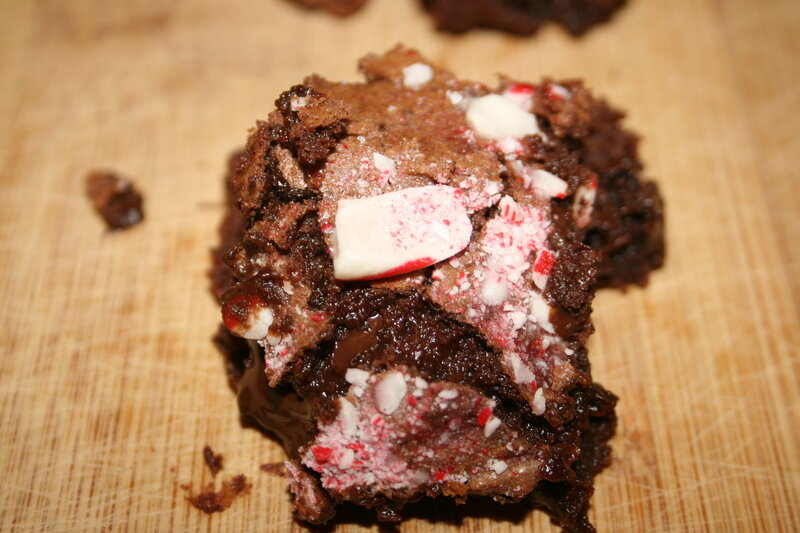 I think they should be referenced as peppermint hot cocoa brownies, because when you eat them warm that is what they taste like. I did change a few things from the original recipe. I could not find dark chocolate cocoa powder, so I used regular, same goes with the bittersweet chocolate chips. Also, fun fact: if you buy candy canes that aren’t the typical red/white variety, they’re probably flavored and do not taste like peppermint. Who knew? I would suggest omitting the chocolate bars in the center for a less messy brownie. 2. In a pot over medium heat, combine butter, morsels, cocoa powder, and 3 tablespoons crushed candy canes until melted. Turn off heat and set aside. 3. In an electric mixer, combine all other ingredients besides the candy canes and chocolate bars. When smooth, add in chocolate mixture. 4. Pour half of your batter into a greased 8×8 square baking dish. Break candy bars into pieces and place on top. Cover with the remaining batter. Evenly distribute candy cane on top. 6. Let cool before cutting. Try not to eat them all!